The IntelLEO project is going to its end, and we are looking back at what we achieved. In the project we assumed that to support organizational responsiveness, cross-organizational learning and knowledge-building should be supported. 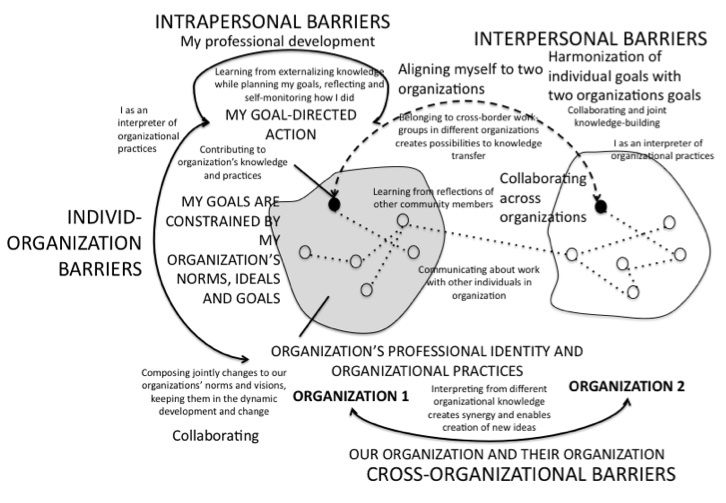 Our assumption was that learning and knowledge-building (LKB) activities across organizational borders as well as within organizations would create conditions for organizational responsiveness to appear. 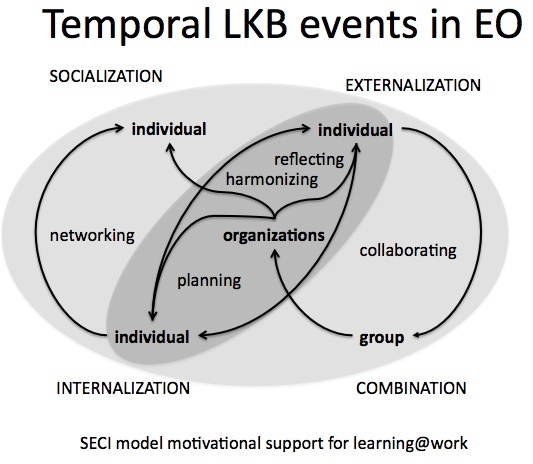 We assumed that extended organizations are connected with temporal learning and knowledge building activities, and we may conceptualize such an extended organization (an IntelLEO – intelligent learning extended organization) as a distributed cognitive system. Distributed cognition involves coordination between internal and external (material and environmental) structures through causal coupling (an embodied cognition) that enables adapting one’s actions to fit to environmental conditions. These also associate with the distributed intelligence and dispersed learning processes carried out in a loosely coupled way. Such distributed intelligence creates a distributed cognitive system that also contains a feedback loop to community/organizational culture – cognitive processes can be distributed through time in such a way that products of earlier events (of the same person, of other community/organization members or members from different community) can transform the nature of later events. – benefitting from community browsing (from shortcuts the personal networks create in the community). Cognitive processes are distributed across the members of a social group (a socially distributed cognition). Acknowledging that someone might read and learn from my reflections. Processes are distributed through time in such a way that the products of earlier events can transform the nature of later events (feedback loop to organizational culture). I have tried to put together ideas associated what may be conceptualized as a open education learning ecosystem. My aim is to propose the meta-design framework for open learning ecosystems such as open courses in distributed social software environments (see Tammets, Väljataga & Pata, 2008; Pata, 2009a,b; Väljataga & Laanpere, 2010; Pata & Merisalo, 2010) or massive open online courses (MOOC) (see Kop & Fournier, 2010; Kop, 2011). A variety of open education approaches exists, since it is a new and rapidly developing domain of elearning. However, we mainly consider such courses where course environment appears as a distributed cognitive system (Hollan, Hutchis and Kirch, 2000) of autonomous and self-directed learners. Hollan and associates (2000) explain interactions and the coordination of activities between people and technologies in whole environments assuming that people form a tightly coupled system with their environments, and the latter serves as one’s partner or cognitive ally in the struggle to control activity. 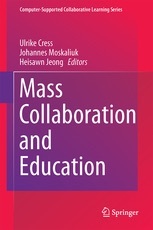 Learners in open education courses are assumed to be autonomous and self-directed and pursuing their personal goals (Väljataga & Laanpere, 2010; Pata & Merisalo, 2010; Kop, 2011). Some learners participate at the courses from outside of the control of the educational institution, whereas others follow some curriculum (Kop, 2011). The users of open learning courses may have different roles such as learner, facilitator/teacher, curriculum-coordinator, course-organizer (university), and they have different type of intentions. These user-roles need to be aware of each others’ conceptualizations of this learning system and considering it in their system application. Learners must find harmony between their own challenges and the course goals. This also immerses additional new goals to the open learning course and shifts the initial course goals. However, in these dynamically changing conditions it may be difficult to sustain the curriculum goals, organize objective assessment and meet the university requirements to objective outcomes-based education. An open course takes place in a digital (but also a hybrid) distributed learning environment (see Fiedler & Pata, 2009; Pata, 2009; 2010; Kop, 2011), which is co-constructed by learners and teachers considering open education requirements as enablers and the curriculum goals and institutional requirements and existing institutional systems as constraints. The learners create personal learning networks (PLN) with other individuals, using social software for connecting people and artifacts. 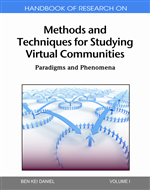 This brings variability of tools and approaches to the course, making the learning environment complex and dynamically changing (Pata, 2009). From the learner’s point of view the emerging infrastructure is a temporally extended personal learning environment (PLE), which allows sharing learning resources (people, artifacts, practices) openly among the course community/course network. It serves as their distributed cognitive system with partially external and uncontrollable locus of control. To monitor learning, learners and facilitators should be easily navigating across the course system. They should adapt themselves to the other individuals’ useful activity preferences with different PLE-configurations, especially in collaborative tasks (Pata, 2009a,b; Fiedler & Pata, 2009). From the teacher’s side, an awareness of the whole system affordances as they are perceived by these learners is needed (Fiedler & Pata, 2009), and communicating this back to learners would serve as a powerful scaffolding element (Pata, 2009b). This requires new type of learner-friendly accumulative learning analytics to appear that visualizes which affordances of the emerging learning system prevail and are effective in certain periods for all the learners. Open education paradigm also applies to sharing course designs and teaching ideas among teachers. To summarize, the individuals’ self-directed learning behavior, personal learning environment (PLE) and -network (PLN) creation, and open publishing and sharing cause this course to be open, dynamic and evolving system. In one hand, learners have to adapt themselves to the course systems and goals. On the other hand, they constantly modify both. The facilitators must handle this intentional and technological freedom that the self-directed learners bring to the course. From the curriculum and system administration side these two aspects are important as well: a) curriculum requirements and technological constraints shape teaching and learning activities at the course, and b) learners’ and teachers’ actions transform environmental constraints into organizational structure and shape it (Bailey & Barley, 2011). Why ecological metadesign is needed? On one hand, the emergent and complex nature of open learning environments suggests embedding ecology principles into the learning design (Young, 2004; Kirchner et al., 2004; Frielick, 2004; McCalla, 2004, Lukin, 2008; Pata, 2009a,b; Pata, 2011; Reyna, 2011). On the other hand, learners who try to adapt themselves to the course environment and simultaneously modify it will make the course environment complex, dynamic and difficult to manage, and some means of regaining the co-control are needed for the facilitators, course developers, organizations and administration. Therefore, the ecological meta-design framework for open learning ecosystems was developed, that considers ecological approaches to cognition (e.g. 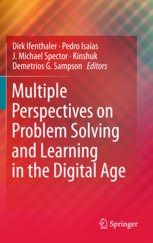 Gibson, 1976; Varela, Thompson & Rosch, 1991; Bardone, 2011), builds on ecological principles applicable in digital ecosystems (see Pata, 2009a,b; Whelan, 2010; Briscoe, Sadedin & DeWilde, 2011), and specifically highlights the need for using the meta-design for designing the design process for cultures of participation (Fischer, Giaccardi, Ye, Sutcliffe & Mehandjiev, 2004) for supporting self-directed learners with social software in open course communities. How ecology concepts and principles could be transferred to open education domain? Davenport and Prusack (1997, p. 11) primarily used the information ecology as a metaphorical term to capture holistic and human-centred management of information. Later several researchers have assumed that ecology principles may be transferred to describe the social, management, design and learning aspects in human computer-supported knowledge networks (Pór & Malloy, 2000; Pór & Spivak, 2000; Siemens, 2006), digital systems (Benyus, 2002; Boley & Chang, 2007; Whelan, 2010; Briscoe, Sadedin & DeWilde, 2011) and digital learning systems (Frielick, 2004; McCalla, 2004, Lukin, 2008; Pata, 2009a,b; Pata, 2011; Reyna, 2011). We assume in this paper that it is feasible using the ecology concepts and principles directly for developing our pedagogical framework for designing new type of learning courses, because these principles enable to see the components and processes in learning environment from the evolving system viewpoint and also suggest effective approaches for the system maintenance. As a starting point we outline the ecological principles, useful in our framework. Ecology as a discipline deals with different levels of structural elements of ecosystems, both biotic and abiotic. Biotic factors are organized in a set of entities grouped in a growing complexity order: individual organism, species, populations, communities and ecosystem. Note that there is no consistency in literature what to consider as biotic and abiotic factors in digital learning ecosystems – users, content, technology and services have all been classified as “living” species or as part of the abiotic environment (see McCalla, 2004, Fischeman & de Deus-Lopez, 2008; Chang & Guetl, 2008; Uden & Damiani, 2007; Lukin, 2008; Pata, 2009a,b; Pata, 2011; Reyna, 2011). In the following paragraphs we describe how we relate the ecology concepts with open learning ecosystems. The branches of ecology as a discipline deal with different complexity levels: Behavioral ecology focuses on the individual organisms of the species with variable phenotypes and behavior. Individual organisms have awareness and they interact, communicate, move, reproduce, and die while living in certain conditions and surroundings. Depending on these interactions the fitness – the extent to which an organism is adapted to cope in the particular environment – is determined. Individual organisms operate for their own benefit or profit and have intentionality. They compete with other organisms from this or from other species for limited resources. In our framework we consider the digital services (e.g. learning services – such as provision of scaffolding and learning contents, technological services – OER services such as Creative commons etc. ), digital technology (such as authoring environments (blog, microblog), mashup-environments (aggregator), social repositories (delicious, youtube), and digital contents (such as blog-posts, comments, ratings) which have been actualized in particular persons’ view of the course environment as the alive “digital specimen” of the certain “digital species”. (Note that besides the learner role, we also see course the facilitator’s and curriculum/system administrator’s roles as users.) Intentions of individual users, as well as their community-cultural belonging give the variability to the “specimen” within “species”. For example the open education culture may influence the intentions of the learner, facilitator or the curriculum/system-administrator in the learning environment*. Population ecology deals with populations of organisms of species, and studies the variability, the abundance and the distribution of individual organisms within one population and within one species in certain habitats. Species is an abstraction for the class of organisms, having some common qualities, characteristics and behavior and ability to give offspring. Species exists in time as a range of qualities, characteristics and behaviors inherited or learned from those individual organisms that were fit to the living conditions. Each species uses a particular niche – this concept denotes the abstract range of biotic and abiotic conditions that enable the fitness of the organisms of this species. A “digital species’ niche” may be conceptualized as an abstract range of dimensions that specify what the environment affords for the particular “digital-species”. Note that not each activated “digital specimen” of certain “digital species” in the open course environment may be totally fit to the “digital species niche”. For example: the niche dimensions for different types of Creative commons licenses may be attributing/sharing/derivating/commercializing, but the fitness of certain user-activated license in a course depends on if the course provides those dimensions so that using the particular license would be effective. An important ecological principle is that for any “digital species” the “niche (as a range of specific affordances)” is determined by those “digital specimen” that were activated by users. “Specimen of the digital species” adapt to the “digital species’ niche”, but also create and modify this niche and the conceptualization, what they are as a “digital species”. We discuss this feedback-loop in more detail in chapter 2.1. The community ecology focuses on the coexisting communities of species (note that the concept is different from what is a community of people), their composition, interactions, organization and succession, as well as, on the web of energy and matter among species. A community is a temporary coalition of naturally occurring group of populations from different species that live together in the same habitat interacting with each other and with the environment. Important characteristics are the diversity of species within the community, their connectedness and aggregation, the competition between species for resources, the mutualisms that are associated with energy and matter exchanges (including parasitism or symbiosis) and communicative interactions between species. Competition has been viewed as one of the strongest and most pervasive forces in community ecology, responsible for the evolution of many characteristics of organisms. Natural selection, and hence the evolutionary process, are the outcome of competition; and are governed by density and diversity of species in the community. While niche is an abstract conceptualization what the species would need for fitness, a habitat is a distinct part of the real environment, a place where an organism or a biological population normally lives or occurs and can be most likely to be found. The diversity of different habitats may be classified under biotopes – areas that are uniform in environmental conditions and in their distribution of species under communities. The biotope concept integrates the environmental factors, which structure the habitat – geographic locations, abiotic features and ‘modifiers’, and species. The biotopes are named after the dominant and structuring biological elements; hence their description does not need to contain ALL species in a community. Biotope offers certain abiotic/biotic factors that influence the wellbeing of the populations of several species (communities). The concepts biotope and ecosystems differ from each other – the former is used for classification purposes, the latter in case of explaining trophic relations. Within each ecosystem are different biotopes (such as among the semi-natural ecosystems are lawns, wastelands, streets, pavement cracks and walls/roofs, however in different geographical regions we may find there certain communities and other abiotic features that give the names for specific biotopes, e. g. the lawns in coastal area, in the parks). 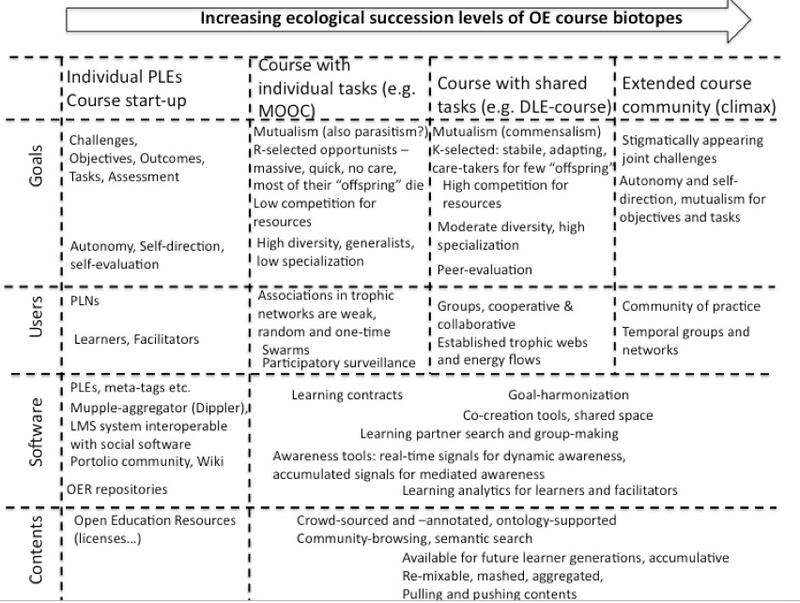 For example, we may consider a certain open education course as a “biotope” type. MOOC, Wikiversity-course or courses held in using the combination of LMS system and distributed social software are kind of biotopes, but all together these may be conceptualized as the “open education ecosystem”. One biotope may be co-occupied by different species and be their habitat, because the niches of these species differ and can overlap. 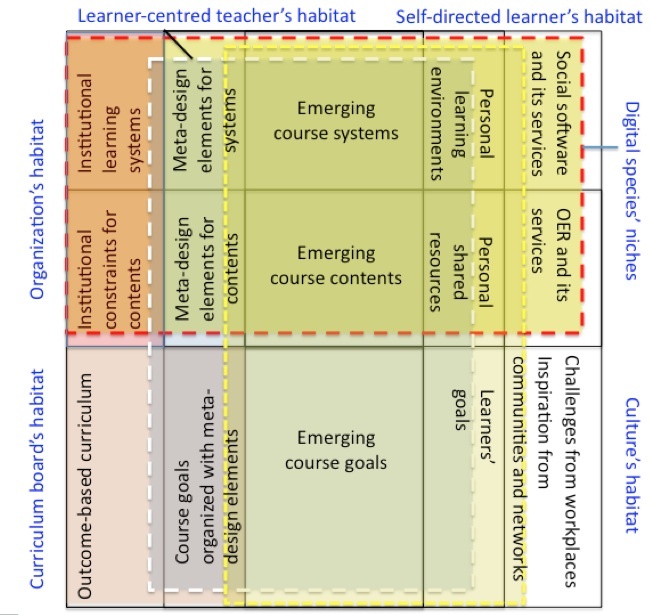 For example the open learning course as a biotope may be inhabited by different “populations of digital species” activated as parts of learners different PLEs (e.g. some may use WordPress, some Blogger; some may prefer filtering by specific content-tags, others monitoring by person-feeds). It is important to note that in natural biotopes the resources are limited by abiotic components and biotic components only compose, exchange, accumulate and decompose carbon, nitrogen and other important elements within the web of energy and matter. Several authors have conceptualized “teaching and learning” as this energy that fuels learning ecosystems and transforms the matter “information” to “knowledge” (Frielick, 2004; Reyna, 2011). Differently from these authors, we intend to use the attention of users as one of the analogues of energy in digital open education ecosystems. In open course biotopes the limited resources may influence the fitness of “digital species” as well – for example if there are not sufficient learners and teachers who prefer certain services (such as tagging, friendfeeds), the other users cannot not benefit from community browsing as a knowledge-building strategy. Connectivity of biotopes is important as well, since organisms usually move between suitable habitats in different locations. For example at the “open learning ecosystem”, the same “digital species” (e.g. OER services for openness such as Creative commons) reappears as the license of digital contents at “digital biotopes” like MOOC, OER Index etc. This would allow the users of the digital species to freely move between these suitable habitats, using OER at constructing MOOC for example. When the density of certain habitats within an ecosystem falls below a critical threshold, widespread species may fragment into isolated populations. The ecosystem ecology deals with the trophic relations – the energy and matter flow in ecosystem. The ecosystem concept considers animals and plants in groups, together with the physical factors of their environment, as a fundamental ecological system. An ecosystem consists of all the organisms living in a particular area (biotic component), as well as all the nonliving, physical components of the environment with which the organisms interact, such as air, soil, water, and sunlight (abiotic component). The transformations of matter and energy are mediated through the functions and behaviors of living organisms and abiotic components. Individuals within one species and between the species interact with each other and the implications of these interactions impact on the energy flow. The permeability of a natural ecosystem to the export and/or import of energy and materials will depend on the nature of the ‘architecture’ of the components of the system, and characteristics of individual species within in the biological component. We define “open digital learning ecoystem” as an adaptive socio-technical system consisting of mutually interacting proactive and responsive regarding to their own benefit/profit digital species (tools, services, content used in learning process) activated by communities of users (learners, facilitators, experts) within their social, economical and cultural environment. In our approach the user-activated “digital species” have variety of connections between them where they use available information(=matter) and transform it to knowledge(=matter) using the attention(=energy). Communicative interactions such as requesting, informing and sharing information and knowledge (Tommasello, 2008) may be direct or the ”digital species” may use information temporarily offloaded/flowing in the system (to other services, to digital contents or software). Interactions between species also result in an open, loosely coupled self-organised and emergent ecosystem to appear. Self-organisation is a process through which the internal organisation of an open system increases in complexity without being guided or managed by an outside source. Characteristics that promote self-organisation include positive feedback, negative feedback, a balance of exploitation and exploration, and multiple interactions. *Do we consider users as species or not? Autotrophes can turn energy to energetic products: information to some meanings in case of contents; activate different tecnology species potentials by evoking affordances? We could consider services, software and content as heterotrophes? They need to use energy-rich products. The first important assumption in ecology is that the flow of energy and the exchange of matter through open ecosystem regulated by the interactions of species and the abiotic component (by the web of energy and matter). Frielick (2004) and Reyna (2011) conceptualized “teaching and learning” as this energy that empowers digital learning ecosystems to changing “information to knowledge”. 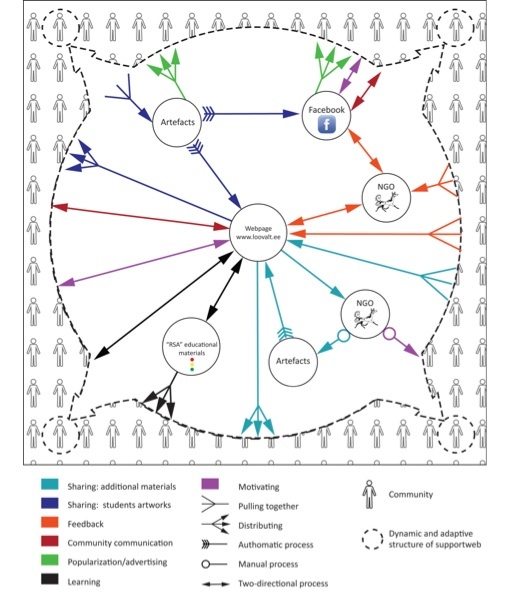 The permeability of a digital learning ecosystem to the export and/or import of information and knowledge depend on the nature of the ‘architecture’ of the components of the system (e. g. connectivity, clustering), the characteristics of species, and their diversity and distribution, and interactions between them (such as commensalism). Second important ecological principle is the feedback loop to and from the environment (dynamic contexts) that enables species to be adaptive to the environment and the environment to change as a result of species. A recent literature in evolutionary theory provides the idea of niche construction (Odling-Smee et al., 2003) as an ecological factor that enables organisms to contribute for and benefit from environmental information. They argue that the organisms have a profound effect on the very environment as a feedback loop. Organisms have influence on their environment, and the affected environment can have a reciprocal effect on other organisms of this species or on other species, creating an environment different from what it would have been before it was modified. This niche construction challenges the convention of a distinct separation between organism and its environment. The niche-construction perspective stresses two legacies that organisms inherit from their ancestors, genes and a modified environment with its associated selection pressures. The authors assume that the feedback must persist for long enough, and with enough local consistency, to be able to have an evolutionary effect. They introduce the term ecological inheritance. Ecological inheritance is a modified environment influenced by organisms, their ancestors or other organism communities what has evolutionary effect and selection pressure to organisms. Genetic inheritance depends on the capacity of reproducing parent organisms to pass on replicas of their genes to their offspring. Ecological inheritance, however, does not depend on the presence of any environmental replicators, but merely on the persistence, between generations, of whatever physical changes are caused by ancestral organisms in the local selective environments of their descendants. If organisms evolve in response to selection pressures modified by themselves and their ancestors, there is feedback in the system. At each level of the ecosystem dynamic agents maintain fitness with one another and within dynamic contexts. This does not happen at the species level. The proactive agents in natural systems are the self-directed specimen from the species who have variability in phenotype and behaviour that influences their fitness to the environmental conditions. At the species-level the fitness of individuals to the environment defines the range of the niche that is suitable for this species for living. Niche is an abstract conceptualization and denotes the range of conditions to which the specific species is best fit of. Hutchinson (1957) defined niche as a region (n-dimensional hypervolume) in a multi-dimensional space of environmental factors that affect the welfare of a species. In our approach the “service-species” are activated by users with different roles (learner, facilitator) and their learning intentions. Ecological psychology (see Gibson, 1977; Young, 2004) suggests that learner’s/teachers’ perception of the learning environment action potentialities (affordances) varies and this would give the variability to the actual use of services in the e-learning system. The niches for each service-species in the digital ecosystem may be collected from this user-behaviour, for example by learning analytics. Individual users activate specimen of the services as part of their learning environments in one hand, and at the same time they are influenced by the niche that each service takes due to many users’ actions. Young (2004) has written that following ecological psychology principles learning is the education of intention and attention, where motivation is reinterpreted as an on-going momentary personal assessment of the match between the adopted goals for this occasion and the affordances of the environment. III. The third important principle that we consider from ecology is associated with the communicative interactions between species. The digital community is a naturally occurring group of “service-species” populations in e-learning ecosystem who inhabit the same habitat (but use different niches) and form temporary coalitions (communities). For example the mutualisms such as parasitism, symbiosis may appear between service species are associated with sharing the resources and associate with our first principle (energy and matter exchanges in the network). Other type of interactions, based on communication, which assumes mutual awareness, signaling between agents (or using the accumulated signals left into the environment) may be distinguished as well. As a result of applying these three ecological principles an open, loosely coupled self-organised and emergent digital learning ecosystem can appear. The permeability of a digital learning ecosystem to the export and/or import of information and knowledge due to teaching and learning power that it has. a) The characteristics of service-species that influence to changing “information to knowledge” (their diversity). b) The connectedness/ aggregation of the services (e. g. connectivity, clustering, and distribution) influences network’s ability to change “information to knowledge”. d) Competition has been viewed as one of the strongest and most pervasive forces in community ecology, responsible for the evolution of many characteristics of organisms. c) Species evolve in response to selection pressures modified by themselves and their ancestors – the feedback from organisms to the environment must persist for long enough, and with enough local consistency, to be able to have an evolutionary effect. III. The communicative interactions between species. Eventually, at different succession levels of biotopes different species appear and the application of ecological principles appears with certain variations. 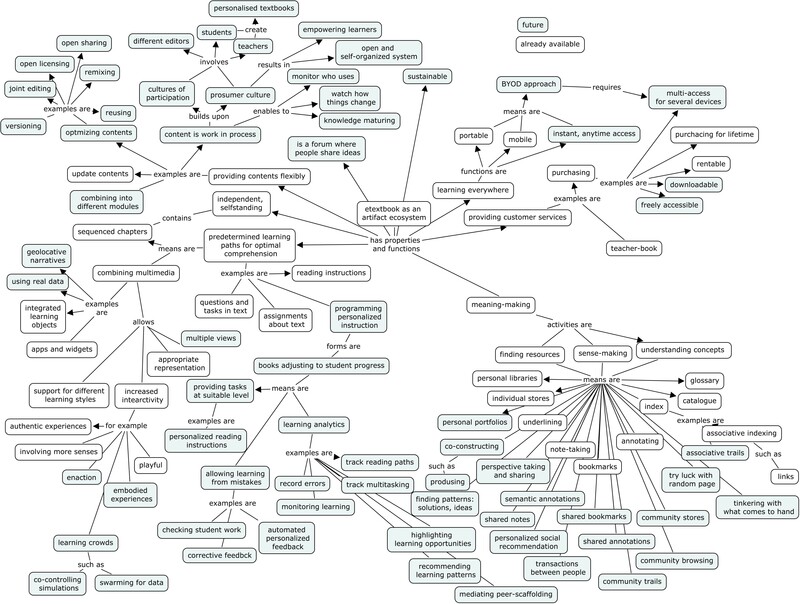 I have tried to model some types of open education courses biotopes and the aspects that influence “species” in these. Recently i was supervising the master thesis of Kristi Laanemäe. She conducted the formative analysis (interviews with art teachers who had used the support-web) to develop and validate and improve the support web concept with social media for art education set “Ready! Set! Art!” website. bring art education up to date. motivates produsers automatically and manually. I particularly like the figure that Kristi developed for support web concept. Support web conceptual model developed by Kristi Laanemäe (2012) for support web of teachers' educational materials in Art. 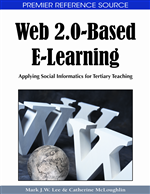 You are currently browsing the archives for the elearning 2.0 category.